At the Insurance Institute for Highway Safety test track, a foam mock-up tests the ability of collision-avoidance devices. Editor's note: A sidebar with this story, which also appeared on Page 40 of the Aug. 19 issue, mischaracterized Subaru's "EyeSight" package. It allows a Subaru to automatically brake when the speed differential between the Subaru and a vehicle ahead is less than 19 mph. RUCKERSVILLE, Va. -- They come with names like City Safety, Smart City, EyeSight, Distronic Plus and Pre-Safe. They promise to watch out for the things you don't notice and react to them before you have a chance to. They are the new generation of crash-prevention technologies, the next frontier in automotive safety. Automakers are marketing them aggressively, charging hundreds or thousands of dollars for add-on packages with such features as automated braking, lane-departure warning and adaptive cruise control. Researchers and Silicon Valley futurists see them as the building blocks of so-called autonomous vehicles, whose interacting sensors and software can outthink drivers and virtually eliminate the risk of car accidents. But as the marketing machines and tech blogs hum, a complex question hangs over the whole field of crash-prevention features: Do they work, in the real world, well enough to trust over a driver's own reflexes? Researchers are used to crashing cars into barriers to see how they fare, but the new wave of technology defies such techniques. "How do you prove effectiveness with a crash that never happened?" asked David Strickland, the administrator of the National Highway Traffic Safety Administration, in an interview this summer. Automakers are selling advanced crash-avoidance and crash-mitigation features mainly through option packages. Here are some of the offerings and the sticker prices for the packages. The Insurance Institute for Highway Safety is spending $30 million on a test track to study the effectiveness of all types of crash-prevention features. Mazda: "Smart City Brake Support"
Mercedes-Benz: "Distronic Plus" with "Pre-Safe"
The search for answers is under way here in Ruckersville, in the foothills of the Blue Ridge Mountains, where the Insurance Institute for Highway Safety has started testing automated braking systems and is spending $30 million -- more than its $22 million annual budget -- on a test track where researchers can study the effectiveness of all types of crash-prevention features. The group hopes the track, scheduled to be completed this fall, will do what its crash-test lab has done: set a standard that drives automakers toward safe design and gives consumers more to bet their money on than marketing hype. The track will rely on a toolbox of autonomous robots, programmed robotic drivers and a proprietary tracking system that is as precise as GPS. For now, though, they've got the "BattleBot," a squat, remote-control droid that looks like a sheet cake with a ramp on each side. On a recent summer afternoon, the BattleBot idled in the middle of an asphalt track at the IIHS lab, topped by a foam dummy resembling the hindquarters of a car. Speeding toward it was a Toyota Prius V hybrid fitted with what Toyota calls the Pre-Collision System, essentially a package of sensors and software engineered to apply the brakes before an impending crash, reducing its intensity if not preventing it altogether. But rather than stopping short, the Prius smashed full-speed into the foam car and sent it flying across the track. The BattleBot, wedged underneath the car for a moment, skittered away like a mouse from beneath a refrigerator. "That didn't work," said Joe Nolan, the head of the IIHS research center and master of understatement, who was looking on. Nolan said his group won't recommend crash-prevention features through its Top Safety Pick ratings unless it can show that they can keep drivers out of accidents and reduce claim costs for the insurers that fund the IIHS. He sees a tough task ahead in separating the crash-prevention gimmicks from the lifesavers. Generations of crash tests -- front impact, side impact, rollover and most recently the "small overlap" test that the IIHS introduced in 2012 -- have helped car buyers understand how well a vehicle will protect passengers in an accident, leading to better crumple zones, seat belts and airbags. Averting an accident is different. "For every one of the things that we have asked automakers to do to get a Top Safety Pick, we have real data behind it that says: 'You will be at lower risk of dying in a crash in this vehicle," Nolan says. "When we start getting to predictive ratings, we just become salesmen. And there's plenty of those out there." Hanging over the research is the legacy of antilock braking systems, which were once touted as a godsend but ended up causing as many accidents as they stopped. Through the 1980s and 1990s, automakers such as General Motors spent heavily to make ABS a standard feature, persuaded by laboratory tests that showed improved stopping distance. GM dearly desired a safety merit badge it could call its own, recalls Mukul Verma, a former top safety engineer for the automaker. On the test track, "all the data showed that the system worked as it should have," says Verma, now a safety consultant and adjunct professor at the University of Alabama-Birmingham. But on public roads, the case for ABS fell apart. Studies repeatedly showed that the technology cut down on multiple-car crashes but made single-car crashes more common. Researchers saw a spike in the number of fatal accidents in which drivers ran off the road. One common explanation was that drivers simply had not learned to use the new brakes properly. "We found that Mr. Everyman could not make a professional stop," Heinz Rath, the technical director of Lucas Braking Systems in Germany, told Automotive News in 1995 as his company worked with Mercedes-Benz to rework its braking system. Looking back, Verma says, the technology "came out a wash."
That was a reminder to researchers and engineers that even crash-prevention features often rely on a flawed human driver making split-second decisions. If an alarm fails to get the attention of a driver, for example, or a technology changes a driver's behavior for the worse, a new technology can backfire. NHTSA is studying automatic braking technology closely and considering a rating system for crash prevention to go along with its five-star crash test ratings. 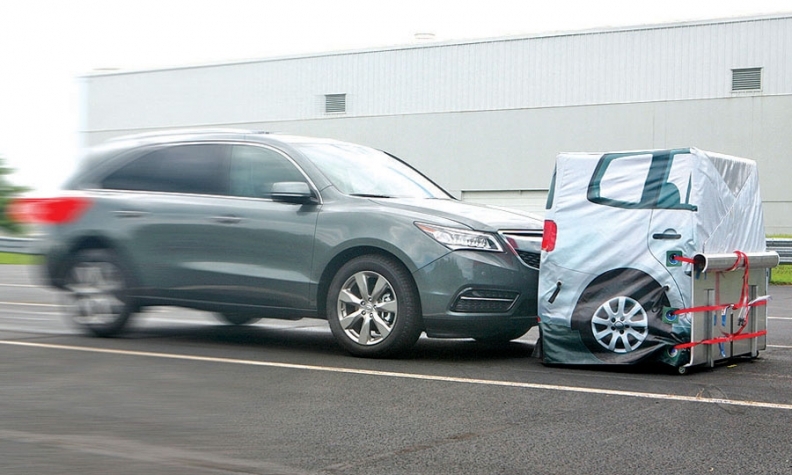 The goal is to cut through the thicket of marketing messages to convey which cars are safest. Crash-prevention features have proved to be a "tough nut to crack," Strickland said, but a $25 million project to modernize the agency's database of crash data, running from now until 2016, could give the agency the information it needs to compare the track records of cars with such features against those without them. That could lead NHTSA to call for new standards, but "we have to be very confident that the system is effective, and the only way we can do that is with the data," Strickland said. Before coming to the agency, Strickland, as a U.S. Senate staffer, helped craft the bill that ordered the only safety standards for a crash-prevention feature: electronic stability control. All new cars were required to have the feature starting in the 2012 model year, and studies have shown that it is reducing accidents and deaths. IIHS is honing its test procedures, mindful that a good performance on the test track isn't proof that a feature will save lives. But the group hopes that the tests, combined with real-world insurance data, will identify the features that work. Nunzio Gambale, CEO of Locata Corp., an Australian company that is supplying the tracking gear for the revamped IIHS lab, said the technical challenge is making the results as replicable as crash tests. But there will be another struggle: communicating the results to car buyers, just as YouTube videos of crash tests explain the virtues of a car with a five-star rating or Top Safety Pick honors. "When you crash something, it's very visible and visceral. We all feel it. You wince when it happens," Gambale said. "The wonderful part about the testing of collision avoidance is that nothing happens. But that doesn't make for very good television." Automakers such as Subaru and Volvo that seek to distinguish themselves with safety technology say they would welcome a rating system to indicate which companies' cars do the best job of keeping drivers out of crashes. Early results from the IIHS show that Volvo vehicles with the City Safety automatic braking feature have about 15 percent fewer insurance claims than comparable cars. To make that point, Volvo has sent demonstration kits to all its dealerships. Dealers can set up pylons in the parking lot and encourage shoppers to try running them over at low speed, to show that the car will engage the brakes on its own. The lack of a rating system "doesn't make it easy" to advertise City Safety, said Adam Kopstein, the U.S. safety and compliance manager for Volvo. For a brand such as Volvo, it works, but "you'd see a much better penetration rate across the industry once you started seeing performance ratings," he added. That could take some time, since the IIHS testing is just getting under way. 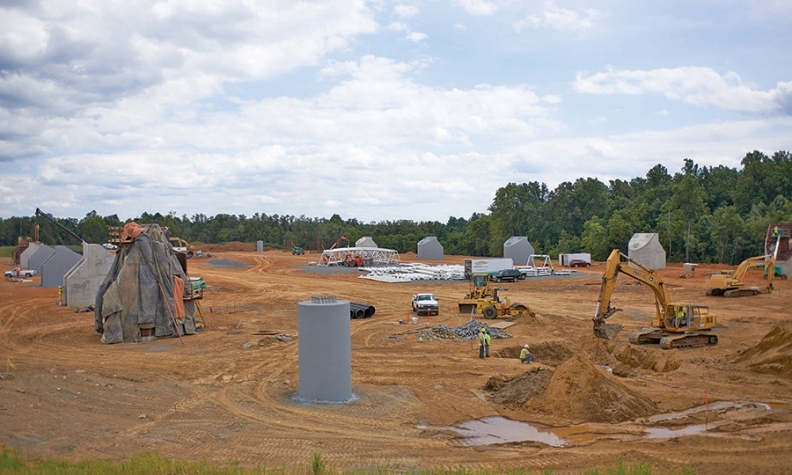 When Nolan drove out to the site of the 5-acre test track this summer, construction crews had finished pouring the 18 cement pillars that will anchor an arched fabric roof with the look of a translucent circus tent. IIHS had hoped to have the track done by the beginning of September, when insurance executives will visit the laboratory for an annual meeting. Because of bad weather this summer, the project won't be finished until the end of September. NHTSA's review of its testing procedures is also in its early stages and could take years. Verma, the former GM safety engineer, said he is convinced the new features can keep people out of accidents, but it will take a while for them to demonstrate their value to the consumer -- and the manufacturer. "There is safety in most of these technologies, but there is also cost," Verma said. "Unless there is a mandate from the government or there is some sort of a reward, like a better score, the automakers will lag."